This was with half a cup of quinoa, a whole cup is better. Scrub and cut the carrots into pieces. Peel and cut the shallots into pieces. 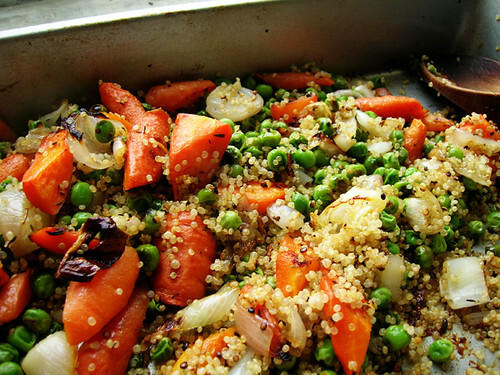 Toss the carrot and shallot pieces in a baking pan with olive oil, salt, and a little bit of thyme. Roast until nicely browned, about twenty minutes, stirring in peas halfway through.